We are living in the Touchback Era of college football. In the interest of increased player safety prior to the 2012 season the NCAA incentivized touchbacks (by bringing the ball out to the 25-yard line for the receiving team) and enabled them (by moving kickoffs up from the 30 to the 35-yard line). That change delivered the desired results. The touchback percentage across college football more than doubled from 2011 to 2012. Last season, it reached the 40-percent threshold. And it's likely to go up even more drastically in 2018. On Friday the NCAA Rules Oversight Committee approved a rule that will allow the receiving team to fair catch any kick inside the 25-yard line and have it treated as a touchback. In recent years some teams have opted to hang kicks high in hopes of landing them near the goal line, forcing a return and hopefully pinning teams inside the 25. "I think it does change a lot of things," Nebraska outside linebackers coach and special teams coordinator Jovan Dewitt said Saturday. "It takes a little bit of the old strategy out of the game where you’re trying to get the ball to land on the 1- or 2-yard line. Having just been presented with that, we haven’t yet fully figured out what kind of strategy we want to use. "You may have to change the kind of kicks that you give now. Unless you’re guaranteed with the kicker to create a touchback, you might have to go with a long, hard squib to force those guys to get into a return mentality. Now instead of telling your kicker to potentially boom it through the end zone, if he can’t, and I think we’re pretty fortunate in what we’ve got, you’ve got to have a guy who can have some accuracy, so I think it kind of changes your philosophy a little bit of having a kickoff guy, no doubt." What the Huskers have "got" is punter Caleb Lightbourn, who Dewitt said Saturday has been handling kickoffs for the Huskers this spring as they look to replace Drew Brown. Brown was slightly above the national average in touchback percentage in 2017 at 46.67 percent, which ranked 50th in the country. True freshman Barret Pickering, an early enrollee, and redshirt freshman walk-on Cole Frahm are vying to replace Brown at placekicker, but for now it'll fall on Lightbourn to employ the Huskers' new strategy on kickoffs. Once they have one, that is. At UCF, Dewitt's special teams unit played kickoffs both ways over two seasons, ranking 119th in touchback percentage (21.9) in 2017 and 33rd (50.7) in 2016. Kickoff return is another matter. The Knights were one of the more aggressive teams in 2017, averaging 24.8 yards per return (10th nationally), taking just 36.7 percent of kickoffs for touchbacks (44th) and recording two touchdowns (tied for sixth). Defensive back Mike Hughes had both touchdowns and ranked fifth in the country at 31.75 yards per return. How Hughes-like any Husker can be in 2018 will be key in determining how Nebraska handles kickoff returns under the new rules. "I think it’s all going to depend on personnel," Dewitt said. "When you’ve got a really dynamic returner, you might tell them never to fair catch it and run the risk of getting tackled on the 20 but also getting it out to a big, massive return. I think you have to look at who your personnel is now and then formulate your strategy off of that based upon their kicker’s skill set, if it’s a windy day, whether it’s a clear, concise day, whether it’s a bad-weather day, now your strategy really changes." Sophomore wide receiver JD Spielman could provide Dewitt with some tough decisions to make. 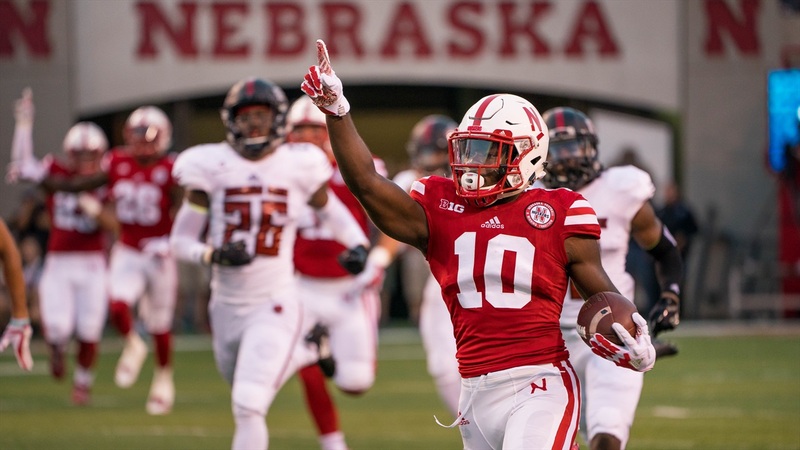 He averaged 24.78 yards per return (28th nationally, third Big Ten) last season and had Nebraska's first kickoff return for a touchdown since 2013, earning all-conference honors as a kick returner and a receiver.